The big retirement living corporations have been patiently waiting for the Baby Boomers to come of age, waiting to tap into one of the biggest pools of private equity in the country – our retirement funds. According to Senior Living, there are 55 companies with 20 or more seniors facilities each1, and in many parts of the country, plans are in the works for many more to start popping up as demand spikes. These days Continuum Care Retirement Facilities (CCRF) are generally marketed as “lifestyle communities”. They work hard to distance themselves from the reputation set by nursing homes in past decades, offering a range of amenities and financial models designed to appeal to a range of clients at various ages, needs, interests and financial situations. Some look for a hefty upfront payment in exchange for lower ongoing monthly fees, but most stick with simple monthly fees and an a la carte fee structure that minimizes the front-end sticker shock. In almost all cases, fees are per individual, so for a couple, this is an important distinction when looking into costs. Few facilities include Skilled Nursing Facilities (SNF’s), as these are reserved for highest care needs. While seniors have been busy watching their stock portfolio and fund management fees, retirement living corporations have been observing the dramatic societal trends quietly going on, and positioned to be there waiting when older homeowners plans to Age in Place suddenly unravel. According to a 2015 Harvard home remodeling study2, senior homeowners are in denial and in for a rude surprise. Those living in the northeast are in the worst location of all, with houses that are the least accessible and retirement facility living is the most expensive3. 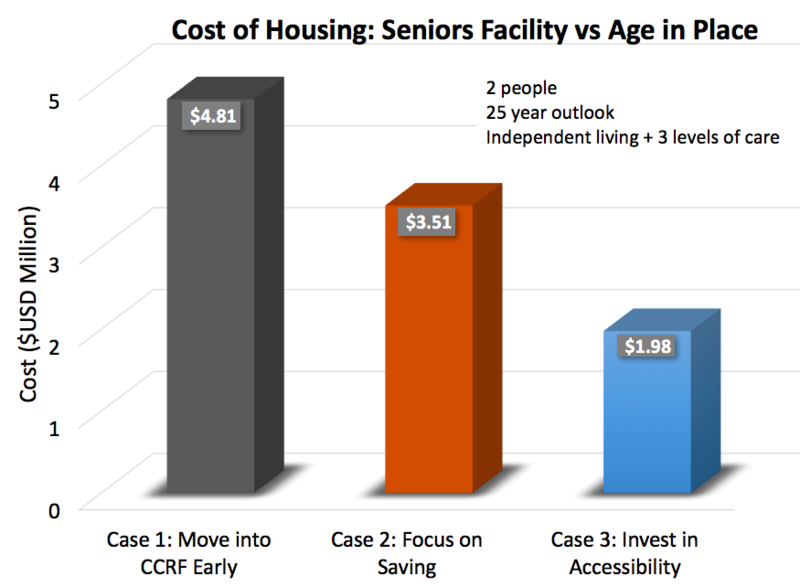 The law of supply and demand rules and so it should be no surprise that the cost of seniors housing is also outpacing the inflation rate by 1.5x4. This is expected to lead to an increasing number of middle class Americans outliving their retirement funds. Ask any eldercare professional advisor, and you are likely to hear a common theme – there is a level of paralysis in seniors’ housing decision-making. “I could have helped them acheive much better outcomes, had they come to me earlier”. It is frustrating for professionals wanting to help, including adult children with aging parents. Baby Boomers are a generation of savers with deep rooted beliefs that saving for a rainy day is wise planning. It served them well through some of our most challenging years as a nation, but it has also set them up as easy targets in their later years. Life expectancy for 70 year olds has risen by 50%5,6 resulting in much longer retirement years to be funded and more frailty to support. On their own, each is significant, but the compounding implications for seniors and their children is hard to overstate. Most seniors are unprepared to the realities they face, and left to make the best of the housing crisis once it confronts them. By then, many better choices have passed them by and all that remains is a short list of alternatives that cost more than they can afford, while at the same time resulting in a sharp drop in lifestyle. It’s often a situation the family hadn’t expected and not how any of them had envisioned the parents’ later years to look. Note that both scenarios exclude Skilled Nursing Facility costs, as these would not be supported either at home or in a typical CCRF. Case 1 is the client with more funds than they could ever spend and looking to get in early and secure their long-term location. It is likely that they would need to relocate within the property as care needs increase, but remain within the overall facility grounds. Case 2 is the vast majority of seniors, and the ones retirement facility corporations are banking on. Uncomfortable envisioning their later years and avoiding thinking about it, many seniors avoid asking many questions about retirement community costs and opt to focus on something they know well – saving money and planning to ride out any storms. Knowingly or not, they are playing a game of Russian roulette with their retirement lifestyle, hoping against increasingly unfavorable odds they are one of the lucky ones who doesn’t have a serious fall or health event. Having failed to take measures to safeguard their home, they are the highest fall-risk candidates and the ones most likely to suddenly find themselves overwhelmed with health issues, unable to consider accessibility at that stage and redirected to securing a safe residence, outside of the home. Case 3 is the informed client who is invested in their community, understands the looming cost alternatives and prepared to make a low risk investment early with the promise of big returns in later years. They reallocate some of their retirement investment to move into an age-friendly, fully accessible home or take steps to make their home accessible and safe, increasing their odds of avoiding falls and implementing several livability improvements that make staying in their home “easy”, even on days when they’re aren’t in ideal health. The notion of a $100,000 investment sends most people running back to Case 2, but a quick look at the financials reveals that the investment delivers a payback if it enables the couple to remain home another 9.5 months. This doesn’t include the additional benefits of avoiding complications due to falls, or the improvement in overall lifestyle. Given the rising demand for accessible housing the investment can also make a lot sense in terms of resale value. Less than 1% of the housing market in the NE have accessibility features2, and homes with quality accessibility improvements that fit with the architecture can add significant value to a property. It combines to help get homeowners out of the short term “cost” mentality and focusing more about preserving the equity they’ve worked so hard to accumulate. For those with the courage to look ahead and develop a realistic plan early enough to actively design their later years, there is much they can do to protect their independence and their equity and enjoy many years in the company of family in their own home.